Brooklyn Wainwright’s best friend Robin has just returned from a trip to India and one of the first things Robin has to do is hand over an exquisite copy of the Kama Sutra to Brooklyn so she can restore it and appraise it for a friend of the family. Brooklyn can barely wait to get her hands on the book but first she wants to hear about Robin’s trip to India and about the new man in Robin’s life. Robin’s happiness is short-lived though because just a day later and the next thing Brooklyn knows is there is a pounding on her door at 5 a.m. in the morning and when she and her handsome boyfriend, British security expert, Derek Stone go to the door they find Robin in tears, in a trench coat and covered in blood. Amidst the tears, Brooklyn and Derek find out that Robin woke up to find her boyfriend dead beside her. The apartment was ransacked and she doesn’t understand how she could have slept through all that happened. Police are called in and Brooklyn once again finds herself in the middle of an investigation. As Brooklyn and Derek trace Robin’s recent history they wonder if the beautiful book Brooklyn is supposed to restore could hold more secrets than they imagined. Once again Brooklyn’s kooky family and neighbors rush in to help and all the while Brooklyn still manages to do some bookbinding on the side. These bibliophile mysteries are very fun for me to read because of the focus on bookbinding. In this one for example, Brooklyn talks about her favorite tools and I can’t help but be a bit jealous of the book press she mentions that she has. If you feel like you might be left out of the loop, don’t worry there’s a glossary covering bookbinding terminology. It’s a cozy mystery that is quite predictable but I know I’ll be back to read the next book in the series just to see what kind of book Brooklyn will be restoring. I love cozy covers like these. 🙂 I’m trying to remember if I’ve read one of her books already . . . I’m drawing a blank. If not, I know she’s an author on my list to at least try. I am glad you liked this one. Predictable is good sometimes, I think. I haven’t really read that many cozy mysteries. I should work some into the rotation one of these days! 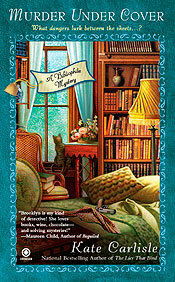 The Bibliophile Mystery series sounds like a fun one, especially if this one had book binding in the mix. I like the cover, and of course, any book about books is always a draw! Kailana – I think the neat thing about cozies is that you can usually find one that has a hobby you enjoy as the central theme. I’m amazed at how many there are! Bookworm – They are pretty cute and I actually thought this one was better than the previous ones so it’s good to see development! jenclair – Isn’t it cute? I agree. I’m tempted by some other cozies that are set in a bookstore. I can’t remember the name of the series right now but I may have to check it out!